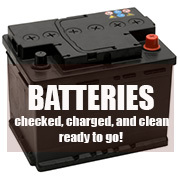 We offer a variety of car and truck batteries. The price is $30 with the old battery. If you do not have an old battery, there will be a $10 core charge. All batteries have been tested. We do not remove or install batteries.